What kind of bicycle do you ride in daily life? I own some bikes, such as a cool road bike and two nice folding bikes. When I ride through the cycling path, I choose my road bike. When I travel, I often bring one of my folding bikes. I have one more bike which is called Mamachari. "Mama" means mom and "Chari" means bicycle. Mamachari is not only for mothers but also all generations and men. 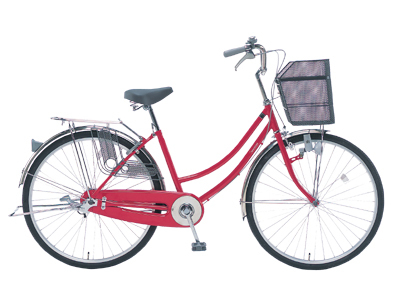 Mamachari is most popular type of bicycle in Japan. Even I have four bikes, I most often use my Mamchari. Mamachari was not invented in Japan, however it is eventually developed into Japanese unique bike. Cycle Tokyo! receives many inquiries about cycling in Japan and bicycles. Some of inquiries are about Mamachari. "I live in outside of Japan and would like to buy Mamachari. Please let me know how can I get it?" This is a typical inquiry. This kind of question has reminded me that Mamachari is unique and attractive to foreign people. Let me introduce some characteristics of Mamachari. I think the Mamachari's biggest strong point is its handiness in daily use. Front basket: Mamachari has a large basket in front. You can put your luggage or / and groceries you bought into it. Rear rack: When you buy a lot of stuff and front basket is full, you can put them on rear rack. Top Tube: The bike has very low and bended top tube. You can easily get on and off it even if you wear a skirt. Dynamo light: You don't need to worry about batteries. Kickstand: You don't need to look for a bike rack or pole to park. In addition to the above points, the price is affordable. Average cost is 20,000 yen which is less expensive than other type of bikes. If you are interested in riding Mamachari during your trip in Tokyo, please try rental bikes. There are many rental bike shops in Tokyo. "Mujirushi Ryouhin Yurakucho" is one of the good rental bike shops which we often use. They offer nice Mamachari at Yurakucho. 1 min walk frim JR "Yuraku-Cho" Sta. Kyobashi Exit. This page contains a single entry from the blog posted on February 16, 2010 11:53 PM. The previous post in this blog was Tokyo Marathon Traffic Regulations. The next post in this blog is Sunday Cycling in The Center of Tokyo.